The story focuses on using principles of the color wheel to guide wedding floral palettes. The Well opens with a color wheel of our featured flora and the story moves from a full ROYGBIV palette to a monochrome look, each incorporating one of four different styles—traditional, rustic, modern, and romantic—to speak to our readers. 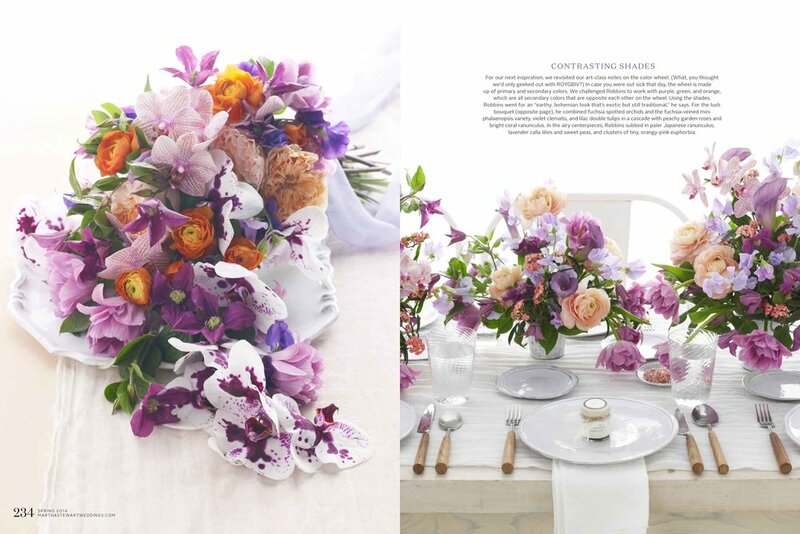 Well opener, stop motion, and feature flowers story for the Color issue of Martha Stewart Weddings. We chose to build on the same framing + white setup indicative of most wedding rentals, so readers could witness how the palette of florals really transforms the tone + environment.